I took this picture and posted it from my iPhone. So this weekend I'm in the Windy City to shoot some video for the DJ. We took the red eye flight out and got in this morning at around 5:30 AM. After a screaming 90 mph taxi ride into downtown we were greeted by vacant streets... kinda spooky actually to be surrounded by such huge buildings and not see any people out and about. 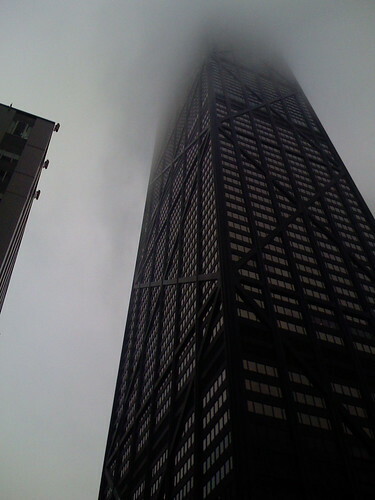 And to add more of a strange feeling to the setting... the clouds were swallowing up the tops of all the skyscrapers. You literally can't see the tops of the buildings at all. Just these massive concrete structures disappearing into the mist. That pic is super duper cool! Deyl - Are you kidding me!?!? It's way too late for that. This is a great picture! :) You have an iphone, that's so cool! It takes really good pictures.